Guy snaps his neck in racing accident, fights back from comas, paralysis, death itself, miraculously regains mobility, and, against every odd there is, drives a race car again. That story contains some larger significance, some poetic closure, right? I mean, it’s got to. He’s conquered paralysis—symbolically, at least. On a brisk Saturday afternoon in Rockingham, NC, I got to witness this very thing firsthand. There was something noticeably in the air as Shane Hmiel pulled off pit road in a modified race car, and onto a track for the first time since this terrible accident. It was one of those moments that makes it difficult impossible to remain impartial–in that moment, when he accomplished what was once unfathomable, all I could think was, This is big. This is important. So long as I’ve known him, Shane has given no sign of being less than totally grateful for his second shot at life. Seriously, no sign. Trust me, I’ve looked—multiple times I’ve tried to find a crack in his positive exterior. The kid is non-stop, glass half-full. I say it’s impossible to keep on a happy face All.The.Time., he responds with (what else?) a happy face and says that it isn’t. Marty Smith said it right: Shane seems indomitable. Saturday was no different—he was excited to get back on the horse that threw him, determined to show everyone watching that you can do anything you set your mind to. Who there could argue with that? In the days that followed, I gradually detached from the emotions at the track. I found my thoughts dwelling on my interview with Shane after he drove—I asked him what it all meant, and he spoke of elation, incredible sensations and powerful emotions. What he didn’t talk about, though, was the significance of the event, even as I gently encouraged him to do so. At the time, I attributed this lack of Grand Meaning to his personality and adrenaline. Looking back over the footage, however, I wonder if I was subtly biased by my own selfish desire for an easy narrative—man is ruined, rebuilt, redeemed. Rinse, repeat, re-air. The fact is, this story exists because sports media wanted it to exist…This is what happens when you report on sports as if they are some sort of metaphor for life, or that athletes are somehow more “inspirational” than regular people. This is what happens when you think sports are more than sports. Let me be clear: Shane Hmiel is not Manti Te’o. The struggles Shane has gone through are very real, heartbreaking, and genuinely inspiring (not to mention, actually IRL). His story does not need manipulation or sappy music or a gauzy sit-down interview; it stands on its own merits and is inherently encouraging to others. Shane himself has been upfront about confessing his various sins and not hiding them. But I have been guilty of maximizing emotional impact in my features. And frankly, it’s very difficult for me not to; I am—my wife can attest to this—both jaded cynic and eternal optimist. I tend to see the world in exaggerated shades of ugly and beautiful, taking both ends of the spectrum a bit too far. I have a penchant for assigning Grand Meaning where I find it, though the story might not, in reality, support one. Maybe it’s because I’ve grown up on these kinds of stories—especially from ESPN; for a long time E:60 was a prominent inspiration for me—or maybe it’s because I’m lazy and I want more bang for my narrative buck. Probably a little of both. Even with a story that stands on its own, as Shane’s clearly does, without need for embellishment, I still found myself pontificating on its Grand Meaning that Saturday. A great story was already there, and yet I was searching for something more. It’s not a matter of getting more eyeballs or clicks or compliments, though I appreciate all of those things—it’s just more personally satisfying to make pieces that are emotionally resonant. I’m seeking my own catharsis. In fact, it’s a large part of the reason I love my job. So what’s the big deal? What does it matter if I tidy up my narratives a little too perfectly, or add my own cherry on top? Being faithful to Reality—which is usually far more nuanced and interesting than we give it credit for—helps us live a more honest, authentic life. For instance, I could have asked Shane if it was a bittersweet moment: although he was back on a track, it was only a shadow of what he had experienced before the accident. That question would have informed the piece at a greater depth than the assumptions I had going in. But it also matters in a larger sense, for everyone that doesn’t tell stories for a living, if you don’t mind indulging me a lowercase grand meaning: the world is messy, and the sooner we demand our media (e.g. myself) to present it as such, the sooner we can come to terms with real life. As opposed to sharing convenient stories that are too good to be true (Manti Te’o), we could share inconvenient stories that challenge our preconceptions (here’s a few to get you started). By saying we should actively seek out the tough stuff, I don’t mean to suggest that life is less meaningful or bleaker than we like to think, only that it exists on its own terms, protected from our self-conceived notions. To avoid the difficult is to avoid existence. I know that all of this seems self-evident, but Facebook feeds full of bogus, easily debunked viral stories suggest otherwise. The people who share them know they are probably not real, they just want them to be. This part of Shane’s story has no Grand Meaning, nor is it a perfect ending: he has years of therapy ahead of him, and he may never walk again. 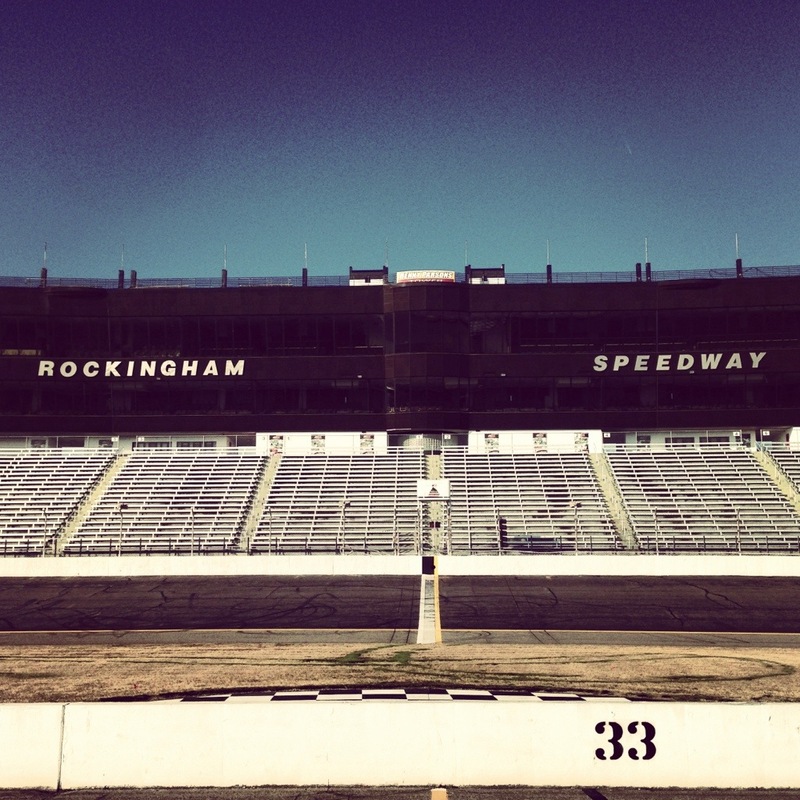 But last Saturday at Rockingham Speedway, he was helped into the only handicap-accessible race car in the US, and drove on a track for the first time since a terrible accident left him with a 10% chance of living, let alone moving again. That’s what happened—no more, no less. 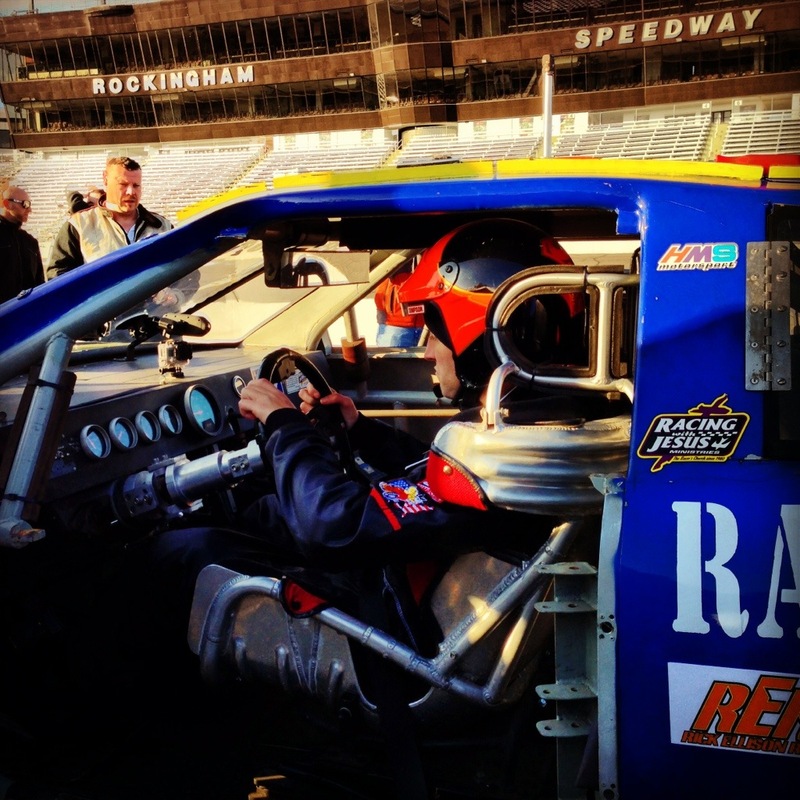 Shane driving again will air on NASCAR Race Hub tomorrow night (2/6) at 6pm on Fox Sports SPEED. It’s the third feature I’ve done on Shane Hmiel.